Before I get started on the topic du jour, I did have a question recently for City Manager Gabe Engeland on the only somewhat forgotten topic of those Library survey postcards. I personally believe that a consensus of all the rumors states the survey results for moving the Library to the Youth Activity Center were not quite as enthusiastic as certain parties might have hoped, and their silence has since grown kind of deafening. Especially when compared to all of that wild noise they had been making. Apparently the cheerleaders have taken their pompoms and gone home. Tattler Enquirer: Anything new on the Library survey cards? City Manager Gabe Engeland: The library survey is currently set for discussion at the second Council meeting in May. The final draft is being finalized right now. I then asked Gabe if he might share any of the results with me, and he demurred. Apparently announcing that is a Mayor leadership function and we're all going to have to wait until May 22nd. I suggest board games to help pass the time spent waiting. Back to the advertised feature. So here is my question. 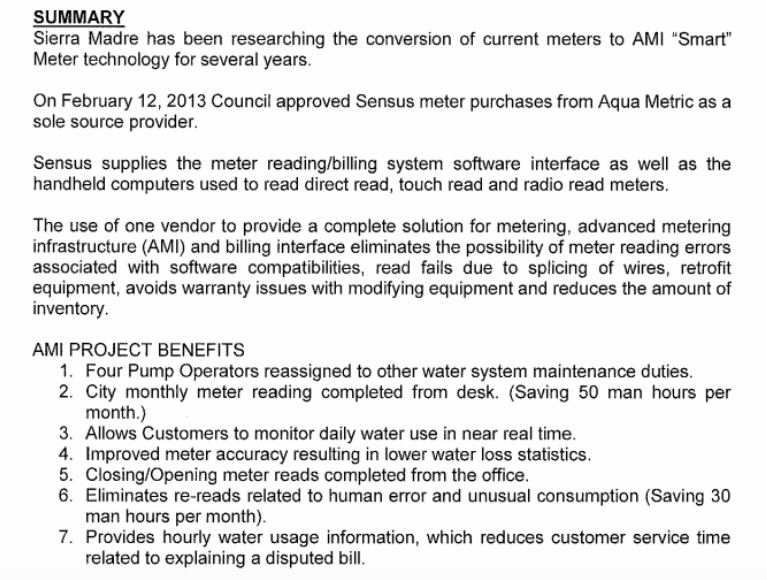 Why is the City spending $947,000 on "smart meters" rather than using the money to pay down the water bond debt, or buy some more of those fine modern pipes? I did ask the City Manager that yesterday, and I haven't heard back yet. Which is fine, I guess. So loaded a question probably cannot be answered that quickly. Besides, Gabe just got back from the SCAG meeting, and there is all of that new received wisdom from Hasan Ikhrata to grapple with. I hear the Man from Moscow took yet another stab at predicting the future, and who knows? Maybe this time he finally got it right. Here is what the agenda item for these water doohickeys actually looks like (link). While those are no doubt fine reasons for spending close to a million dollars that the City of Sierra Madre's heavily indebted water enterprise is not supposed to have, it really is a lot of dough. Especially after that seemingly endless series of water rate increases the consumers of the wet stuff have endured over the last decade or so. 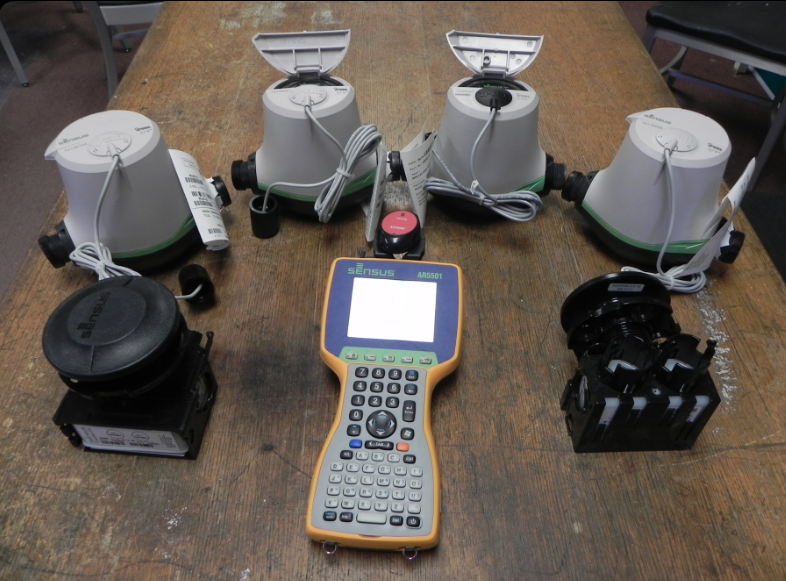 And while there is no doubt that reading water meters from the comfort of an office somewhere just cannot be beat, shouldn't those past messes be cleaned up first? You know, before the water guys are allowed to get all Jetsons on us? Apparently the restless ghost of Bruce Inman still wanders the offices of City Hall. The current city council wants to make the jobs for the employee's easier and more efficient when reading those smart meters, after all the city is moving ahead into the future and those UUT dollars protect the town against any financial failures moving forward. Just looked at my water bill. The city will pay you too go to automatic payments. The psychology for them doing that, is people don't write a check for the water and are less likely to see increases in rates or cost. Just like in Vegas you are playing with chips, not money. 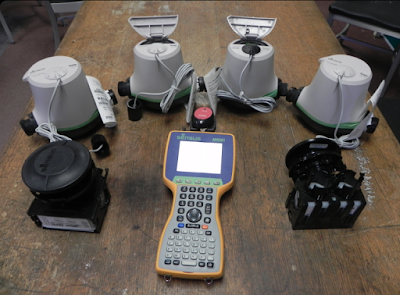 These smart meters will provide the man power to fix the numerous water pipe leaks that are occurring on a daily basis. The water pipes need replacement not the temporary fixes that are now being provided by water work crews. What if they took the million dollars and fixed the pipes once and for all. Then there wouldn't be any leaks. They read the meters one day a month. Poor argument to spend almost a million dollars. The million dollars will be just about enough money to purchase about a two block radius of smart meters. That's a whole latta smartass water meters working for efficiency, the technology should remain current for the rest of the town to be planned into the future at a later date. Smart meters will radiate strong radio frequency energy day and night which will inversely impact living things' health nearby. 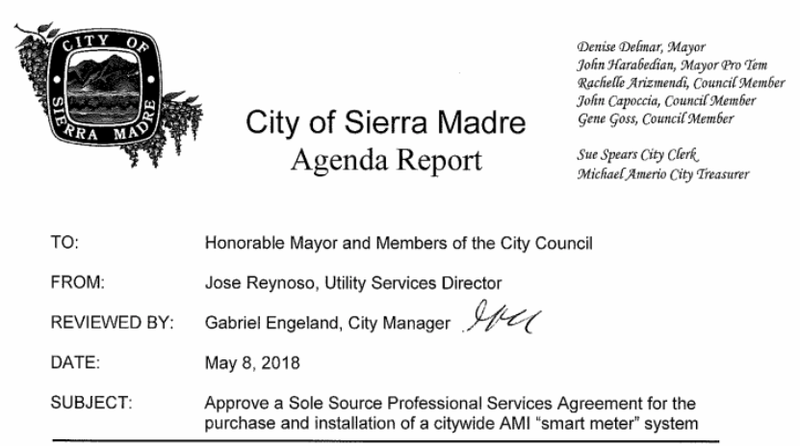 This will become a wild ride for ALL Sierra Madre water customers if the city has not already included a RTS - ready to serve FEE in your water bill then it will happen soon. 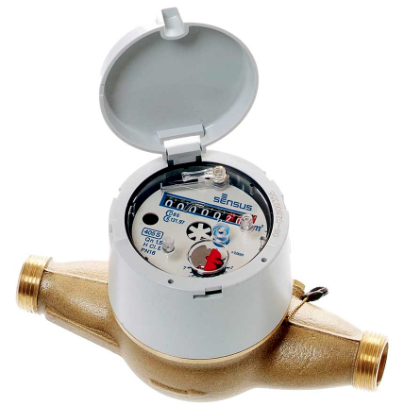 This fee will be needed to pay for all the leaks that will be found with this New electronic Water Meter reader system. More later of course it will not be pleasant. Thanks Mod for bringing this to our attention. Would you also have any updates on the Solar System that was purchased to be installed down by the YAC Center with the caveat of NO back up storage batteries? 6:35am. When using the term "man power", are you saying that Sierra Madre will be hiring more employees? When the water rate increases were being pitched the last few times the two reasons given were getting a handle on the bond mess and restoring infrastructure. I don't recall anything about smart meters. If there is a million dollars laying about for such frivolity, would the City Council like to entertain the possibility of reducing water rates? These smart meters have been around for a while. Wasn't it an optional thing you could sign up for at first, with a long term goal of city-wide use? or how about using that money to pay down the bonds? I wish someone would spend $947,000 to make my life easier. These meters are already being installed, right? I thought so, too. But the agenda report suggests otherwise. There's a city water truck going around working on people's meters - I think it's a done deal in some parts of the city. This staff report claims that approximately 2000 smart meters have already been installed. Years ago, I recall Bruce Inman saying that Sierra Madre has about 3700 water customers. Just last week a city worker turned off our water, put in this meter, and then drove away without turning the water back on. If it is a done deal then what is the City Council talking about tonight? As I read the staff report, this has been in the works since 2013. And I recall one utility worker trying to talk me into installing it when he was checking for leaks. The ciity, working on two leaks in the canyon, resulted in a water hammer in our household pipes unlike we have ever had before. Very annoying. Will hammer even when we don't have the water on (automatic ice maker maybe?) and each and everytime we open a fawcett. The city bought some smart meters awhile back but did not do the whole city. Now that company is not around anymore and to do the whole city they have to start over and replace the old ones with new ones as they finish the city. Wha? So they have to replace old smart meters with new smart meters? Are they smarter? The meters I mean. So they will all be the same? Can't mesh the two different types? The water meter is not near your house, but at the road side, so I am not sure how much radio frequency is going to get inside your house where you probably have lots of other devices to "plague" you. However...the real problem with this Crawford addressed. It's a waste of money that would be better spent otherwise. Wish the city would bring in cell phone frequency, i don't care where it would be located on the street, I'd just like to have 21 century communication. 7:20 am. Is that the same fee for charging customers water coming into the house and the the additional charge of water leaving the house? What percentages of the UUT will be applied to these new charges? Sierra Madre City Council Members? This is an outrageous waste of city funds. Thank you H.for bringing this to our attention and thank you Crawford for exposing exposing this. Obviously I love the idea of daily water-use monitoring. Any time I know more specifically when to scream at my kids, I'm in. But a MILLION DOLLARS?! Any chance we could shop around first? Shoutout to the tin foil hat folks commenting this morning. The comments here are always entertaining until someone mentions Trump, but I think we have an outright winner today. Transparency from City Hall. Not much has changed. Why would this council not pay off the Water Bonds before spending anymore money for any amount of reason they may come up with. Same old s#!t, different day. Sorry 9:14 you posted too soon. 9:51 is a broken record. 9:08am. The difference being, President Trump would cut out the excessive spending on Smart Meters as unnecessary at this time. Assuming "H" is not Hillary in 9:05am post, this item up for discussion was discussed and voted on last year by this council, it is now receiving the classic rubber stamp of approval by all council members. More like show and tell on Tuesdays 2nd & 4th of the month. You should call up your pal Trump and ask him to stop paying for SCAG. Of course, SCAG exists to crowbar crap development into towns like Sierra Madre, and as a developer he's gladly accept that kind of welfare because it benefits his profession. Ahh No. That would be your Governor Jerry Brown, "believe me" he is no friend if the Don. SCAG/Southern California Association of Government. You and I pay for that crap, and Welfare doesn't give enough dividends on returns within the Building and Development Planners and Investor's, why do you think so many people live on the streets? Your Progressive Government in California hard at work for you. SCAG receives a lot of Federal funding. Though I can understand your need to blame others. Fix the Deal, a 90 day count down before reinstating sanctions. Trump is leaving America's great ally in the Mideast, Israel, in a very dangerous spot. Ahh No. It as Israel that was able to show the world that Iran has not kept the promises it made under President Obama. Israel has always been in a dangerous spot; open the the King James Bible and read. Now powerful sanctions will go back into place after 90 days. The poor people of Iran suffer at the hands of the Mullah's, the billions f dollar's released back to Iran went to pay off the Mullah's and 40% back into their military, the Iranian people still scrape by on potatoes and rice as they have for years. Israeli totally corrupt. Why believe them. Read some real history on this deal. It was the best case scenario for all. Trump trolls lose again and everyone suffers. Please check to see all connections are tight and the smart-meter install crew haven't broke your pipe after the meter since this lost water will be billed you you at a very expensive rate even though the install broke your water pipe. Lol 10:44am. Good luck in applying for those Federal Government Grants and receiving any. Do you think I am SCAG? Israeli PM Netanyahu just thanked President Trump in a speech saying you are restoring trust back into the area in keeping Necular Weapons and programs from continuing operations. ‘Necular’? Did you steal that line from Dubya? Troll translator poorly functioning. US was cowardly to walk away from a deal and cave to corrupt Netanyahu. Iran has the right now to pursue nuclear weapons now. May home owners expect water rebates? Is it time to end the Water Moratorium? I've heard that Landscape drought tolerant plantings are being offered again from the County, would the Sierra Madre Council have any further information about this? Council will hold a special session to google it for you. Good to acknowledge that they are good for something other than spending money on what ever tickles their fancies. Seeing how much Sierra Madre's "public servants" are making, what's another $900k+? No Council Meeting on channel 3. Why? US military wives who thought they were being terrorized online by ISIS were actually being terrorized by the same Russian trolls who helped the Trump campaign. Maybe Trump supporters can help explain this for us. Maga guy, tell us how terrorizing military wives is good for America.